LDR-based automatic lights flicker due to the change in light intensity at dawn and dusk. So compact fluorescent lamps (CFLs) are unsuitable in such circuits as flickering may damage the electronic circuits within these lamps. 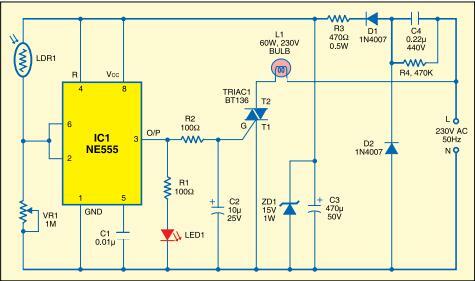 The circuit described here can solve the problem and switch on the lamp instantly when the light intensity decreases below a preset level. The circuit uses popular timer IC NE555 (IC1) as a Schmitt trigger to give the bistable action. 1 Response to "LDR Based Sunset Lamp-IC NE555 Based Circuit"